This month, we're all celebrating: Kim's new book, The Meat Lover's Meatless Cookbook: Vegetarian Recipes Carnivores Will Devour, will appear on store shelves September 14. Want to rethink the meat-centric Labor Day picnic? Or learn how to pack meatless lunches for the back-to-school members of your household? Kim can help you meet those meatless-eating challenges — and she's got lots more to say about meatless eating as well. 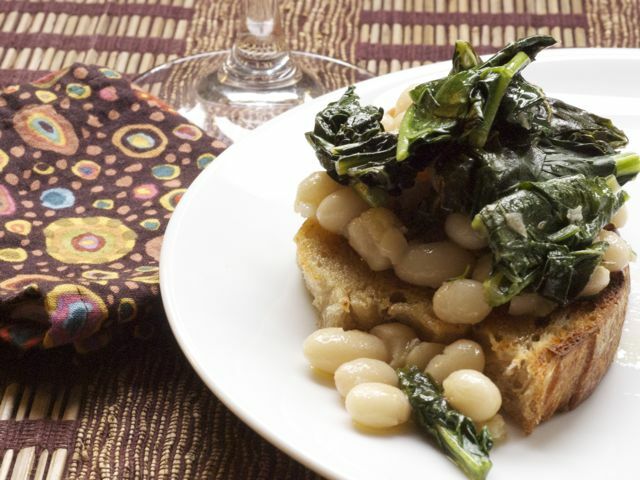 [%image reference-image float=right width=400 caption="White Beans and Greens Bruschetta"]Join Kim, right here, on Thursday, September  2, at 1 p.m. ET, 10 a.m. PT. Sign up below to receive an email reminder of the chat.